Is Guitar Hero saving rock 'n' roll? Metallica's Lars Ulrich loves Black Sabbath and Deep Purple - and so does his 10-year-old son, Myles. Ulrich still plays songs from those bands around the house on his stereo, but he credits his son's excitement to another source: the video games Guitar Hero and Rock Band. "It's a cool generational thing to share that with your kids," says Ulrich of the game systems. "My son's favorite bands are the same bands that are my favorite bands - the bands I grew up on." Only a few years ago, rock music was struggling on the charts. With hip-hop and teen pop ruling the day, rock was finding it hard to break through with new music - or sell more of the old. 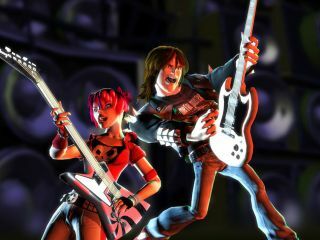 But Guitar Hero and Rock Band have prompted kids born in the '90s to discover artists from the '70s and '80s such as Aerosmith, Twisted Sister and Pat Benatar. The games's amazing popularity - last year, the two brought in more than $935 million in revenue - have helped create success in other markets. Geoff Mayfield, senior analyst and director of charts for Billboard magazine, sees a direct cause-and-effect for some of the artists who have licensed their songs to Guitar Hero. "A few weeks ago, when the game featuring Aerosmith [Guitar Hero: Aerosmith] came out, there was more than a 40 percent increase in their catalog sales. I expect you'll see that again when Metallica gets the same kind of treatment in a few weeks,"
Once wary of downloading, Metallica have changed their tune with their upcoming album. "When Death Magnetic comes out in September, you can actually download the new album the same day it comes out, and play it on your Guitar Hero III," says Ulrich, fully aware of the irony, given his band's past litigation with the Internet music file-sharing service Napster. The video games have also increased interest in guitars, according to the nationwide Guitar Center chain. And bars holding Guitar Hero nights have enjoyed a boost in business: The Big Wangs sports tavern in Hollywood, California, reports a 25 percent to 35 percent increase in sales. The results have played out at such places as Roosevelt High School in Los Angeles, where most teens have grown up on a steady diet of hip-hop and R&B. Recently, heavy metal blared from the school's darkened auditorium as it sponsored a three-day Guitar Hero Face-Off. Spotlights illuminated the competitors, and an audience full of enthusiasts screamed wildly at the end of each song. According to Mayfield, the marriage of music and video games makes perfect sense, especially for an ailing record industry that's been having trouble selling CDs. "This is a chance for something that's been a competition to actually be an ally, if you will," he says. Mayfield admits he has never played Guitar Hero or Rock Band hjimself, but he said he understands the irresistible appeal of kids and adults indulging in some harmless headbanging. "If you've ever played air guitar, more than likely, you weren't doing it to a Michael Jackson song. You were doing it to an Aerosmith song," he says.